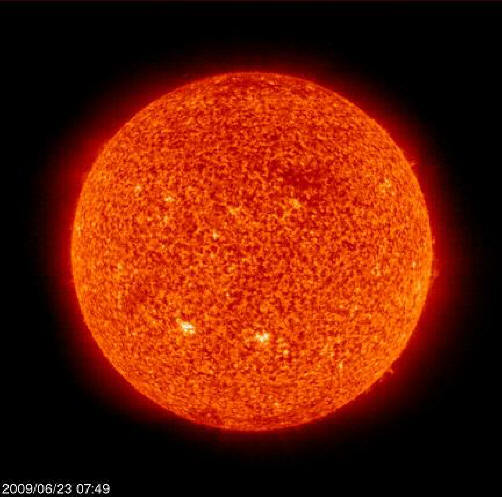 Ideas about the Sun based on fusion reactions in a dense core do not fit the observations as well as those based on electricity. In a recent Picture of the Day about Solar Cycle 24 and the lack of sunspots in a relatively quiet solar disk, it was noted that sunspots are not well understood by astronomers. Furthermore, their bizarre electromagnetic displays are not readily explainable by models of solar activity that rely on radiant emissions from thermonuclear energy. The Sun demonstrates that electrical and magnetic properties dominate its behavior. In the electric Sun hypothesis, the Sun is an anode, or or positively charged "electrode." As previously mentioned, the cathode is an invisible "virtual cathode," called the heliosphere, at the farthest limit of the Sun's coronal discharge, billions of kilometers from its surface. This is the double layer that isolates the Sun's plasma cell from the galactic plasma that surrounds it. In the Electric Universe model, most of the voltage difference between the Sun and the galaxy occurs across the heliospheric boundary sheath. Inside the heliopause the weak electric field centered on the Sun is enough to power the solar discharge. The visible component of the glow discharge occurs above the solar surface in layers. In the chromosphere, at 500 kilometers above the surface, the coldest temperature exists: 4400 Kelvin. At the top of the chromosphere, 2200 kilometers up, the temperature rises to about 20,000 Kelvin. It then jumps by hundreds of thousands of Kelvin, slowly continuing to rise, eventually reaching 2 million Kelvin in the corona. The Sun's reverse temperature gradient agrees with the glow discharge model, but contradicts the idea of nuclear fusion energy trying to escape from within the Sun. The discovery that a "solar wind" escapes the Sun at between 400 and 700 kilometers per second was a surprise for the nuclear theory. In a gravity-driven Universe, the Sun's heat and radiation pressure are insufficient to explain how the particles of the solar wind accelerate past Venus, Earth and the rest of the planets. Since they are not rocket powered particles, no one expected such acceleration. According to the electric Sun theory, an electric field focused on the Sun accelerates charged particles: the faster they accelerate, the stronger the field. But as noted, the interplanetary electric field is extremely weak. No instrument would be able to measure the voltage differential across 100 meters, but the solar wind acceleration over tens of millions of kilometers does confirm the Sun's e-field, enough to sustain a drift current across the Solar System. Within the spatial volume, the implied current is sufficient to power the Sun. "In order to maintain a stable sheath between the photosphere and the corona a great many electrons must flow downward through the sheath for each ion which passes upward. The solar gas shows an increasing percentage of ionized-to-neutral atoms with altitude. Some of the rising neutral atoms become ionized by collision. Some fall back to the solar surface. The rising ions ascend into the corona where they become the solar wind. The descending gas flows back to the Sun between the granules—in these channels the electrical field is such that ions straying out from the sides of the photospheric tufts flow sunward, and hence the electrons flow outward. The presence of these channels is critical to the maintenance of the solar discharge"